A group of alumni, former faculty, exchange students and current students are beginning the process to form a Clemson Club in Japan. They recently gathered in Tokyo with a group of about 12, including former faculty members Toshiko and Yuji Kishimoto, at an izakaya (a Japanese gastropub) for drinks and food and then went to an Italian bar. They closed out the evening with another mixture of cultures: a traditional Japanese-style event closing punctuated with the cadence count. Mike ’97 and Holly ’95 Cirrito. More than 125 alumni, parents and students attended the event. To find a Clemson Club in your area, visit clemson.edu/alumni. More than 30 members of the New Orleans Clemson Club attended the Manning Award Ceremony ­on May 17th in support of this year’s recipient, Clemson quarterback Deshaun Watson. Watson’s mother and aunt also attended the ceremony that is hosted by the Allstate Sugar Bowl. Brandon Streeter represented the football staff, and Stewart Summers represented the Alumni Association at the event. Cooper Manning, son of Archie Manning and brother of Peyton and Eli Manning, presented the award to Watson on behalf of the Manning family. The Manning Award, now in its 12th year, was created by the Allstate Sugar Bowl to honor the college football accomplishments of Archie, Peyton and Eli Manning. It is the only quarterback award that takes into consideration the candidates’ bowl performances in its balloting. The award is voted on by a panel of local and national media, as well as each of the Mannings. Watson, the first sophomore to win the Manning Award, had 405 yards passing and 73 yards rushing for 478 yards of total offense against Alabama’s No. 2 ranked defense on Monday night in the National Championship game. The Crimson Tide defeated Clemson 45-40. Nationally, Watson ranked first in the nation in QBR (87.8), third in the nation in points responsible for with 282, fifth in completion percentage (.678), eighth in touchdown passes with 35, eighth in total offense per game (347.3) and 12th in passing efficiency at 156.3. In addition to the Manning Award, Watson was named the consensus All-America quarterback, was third in the Heisman Trophy balloting, was the Most Valuable Player of the ACC and was the MVP of the ACC Championship game and the Orange Bowl. Alumni survey: You spoke, and we listened. 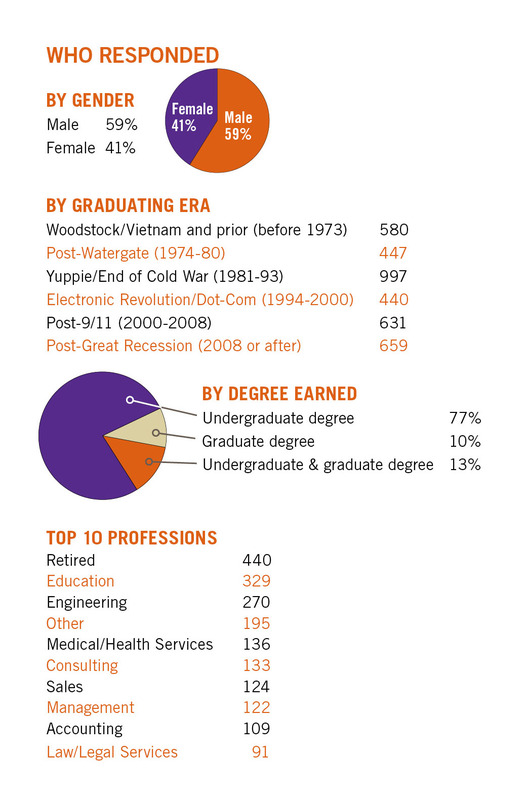 Every three to four years, we survey alumni to gauge how we’re doing as an alumni association. We look to see how you feel about the University — about choosing to attend, your experience as a student and as an alumnus — and what impacts your current opinion of Clemson. We also want to discover what you need from us and how we can better serve you. We use this information as we plan for the future, as we decide which programs need to change and how can better serve you, the alumni of Clemson. This year, we sent out more than 65,000 surveys, and 3,782 of you responded. Here is just a snapshot of the survey results. The “Satisfaction Index” is calculated by averaging responses to these four questions, with the result being expressed as a percentage. • How would you rate your decision to attend Clemson? • How often do you promote Clemson to others? • Which of the following best describes your experiences as an alumnus/a? • Which of the following best describes your overall current opinion of Clemson? 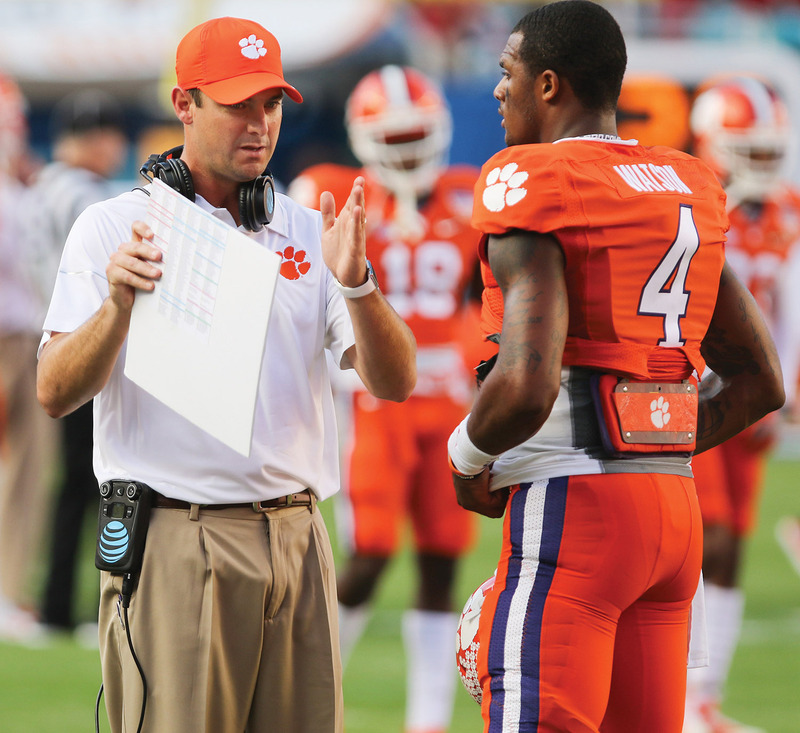 While the national average is 80 percent, Clemson’s number has moved up from 89 percent in 2012. Alumni rated email, Clemson World magazine and the Echo (electronic newsletter) as the three most important communication methods. Younger alumni feel that we’re not using email as effectively as possible. We also need to improve in the areas of invitations to University and alumni activities, and to communicate more effectively about services and benefits of being an alumnus. When asked, “How important is it for you and alumni in general to do the following and how well does Clemson do at supporting alumni in doing them?” alumni ranked four areas of alumni involvement as “very important.” The top two were serving as ambassadors by promoting Clemson to others and identifying job opportunities for graduates. In both of those areas, we need to provide more support for alumni. Third ranked was recruiting students, and fourth was providing financial support for Clemson (e.g., donations). Alumni feel Clemson supports them well in those roles. Not surprisingly, all three were ranked higher by younger alumni. Thank you for letting us know what you think. We have already begun planning in the areas you’ve told us need improvement, and we’ll communicate with you about the process and ask for feedback.